When I was a kid I would eat handfuls of Red Hots until my mouth was on fire. Spicy cinnamon has been a favorite flavor ever since. 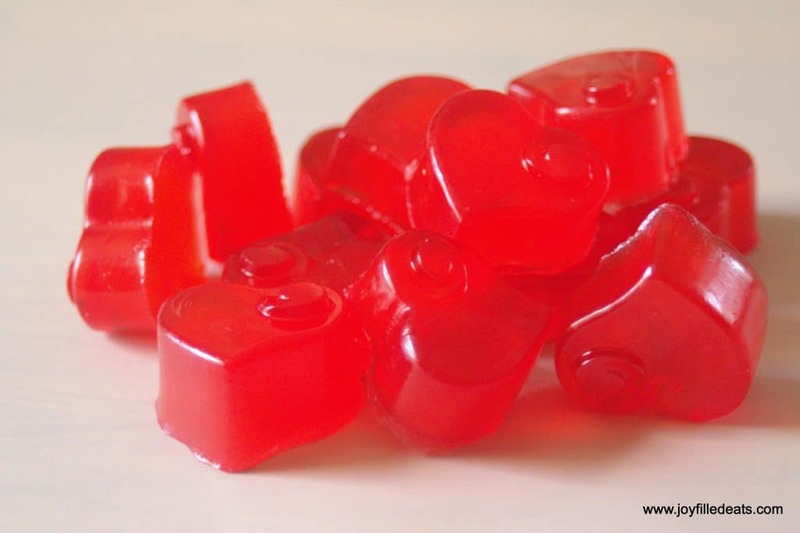 When I found cinnamon oil I knew I had to use it in a batch of Red Hot Cinnamon Gummies. Gummies always make me feel like a kid. They are my favorite candy and one I really missed when I gave up sugar. 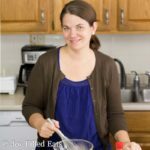 Making sugar-free gummies at home is easier than I thought it would be and can be a great way to satisfy your sweet tooth. At first, I used a tiny dropper but then I got impatient and tried to pour a few drops faster. Woah. My mouth was burning. But it was a good burn. These are really good. If you like spicy cinnamon just keep adding drops until your mouth is happy. I use LorAnn Cinnamon Oil in these. You can either buy tiny bottles, small bottles, or an assortment of flavors. If you really like cinnamon the small bottles are the most economical. Remember that you only need a few drops for a recipe. The tiny dram bottles still have enough for 4 or 5 batches of gummies. These are low carb, gluten free, grain free, sugar-free, and a THM FP. This recipe makes about 2 dozen gummies. You can double it to make more. These spicy cinnamon gummies are the best healthy snack. They are sweet and spicy despite being very low in carbs, calories, and fat! Combine first 3 ingredients in a small pot and heat over low to medium heat until very warm. TASTE IT. You can add more cinnamon oil or more sweetener (add stevia if you'd like). Tailor it to your taste buds. Slowly whisk in the gelatin until dissolved. At this point I pour it through a mesh sieve to strain out any pieces of gelatin that didn't dissolve. Pour into silicone molds and refrigerate until firm. It says low carb with a little less than 3 calories per gummie, but what is the carb count? Love cinnamon (and gummies) and can't wait to try this! Thanks! 0. They don't have any carbs. Thanks so much for this recipe idea! I used beef gelatin and Allulose for the sweetener. Delicious and all my non keto friends want to make them. Only question is that your pics show solid color thru the gummie and mine are translucent. How did you achieve it? Thanks again for giving me a new, healthy treat! It probably depends on the brand of gelatin and the type of sweetener used. Do I have to use 2 different sweeteners? I have liquid Pyure, powdered pure Stevia and powdered and granulated Swerve so I am unsure how much of one or two sweeteners I need to add to this recipe. You can really sweeten this one to taste. I'm not sure of the conversions for all of those. I know swerve should be 1.5 to 2 times the amount listed. So why is it that you use two different sweeteners? What is the reason for having to use both instead of just one or the other? I am dying for something keto friendly that is cinnamon so I want to make sure I do it right. By adding a little extra pure stevia powder it increases the sweetness without the expense of a granulated sweetener. I followed this recipe exactly and all the gelatin dissolved and I also got hard jello....not the texture of regular cinnamon bears. You should tell people that in your recipe. May be ok for some, but I want thee real thing. After buying all the ingredients and molds......I through the finished product out. The taste was there, but that part is a no brainer. Still looking for the right recipe. I'm sorry you didn't like them, Lillian. I never claimed they were like 'regular cinnamon bears'. It may be impossible to get a true store bought gummy texture without sugar. Even the new sugar-free gummy products on the market are not the same texture as the sugar varieties. These are more 'gummy' than 'jello'. Where can I get cinnamon oil? I just found cinnamon oil flavour. That's the one I use. Lorann brand. I used it , also but put in the whole little bottle. Spicy but so good!! Thx for the recipe! Each gummy ends up with less than a drop of cinnamon oil. Just made these. They came out great, I just need to use more cinnamon next time. 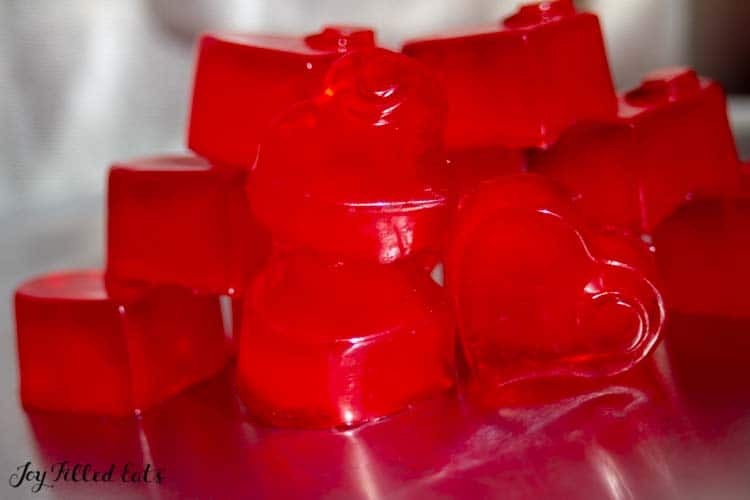 I used the THM Gelatin and added 3.75 of a Tablespoon and they were the perfect gummy bear consistency. Thanks for the recipe. Mine turned out clear & essentially like cinnamon jello. Any tips for what I did wrong? The color of mine came from the couple drops of red food coloring I added. Which brand of gelatin did you use? With stevia, are your scoops the same as THM donks? 1 scoop of Better Stevia is 45 mg. The THM site says a doonk is 55 mg so it's a little bigger. Can I use splenda instead if THM? Possibly. I haven't tried it but I think it would work. 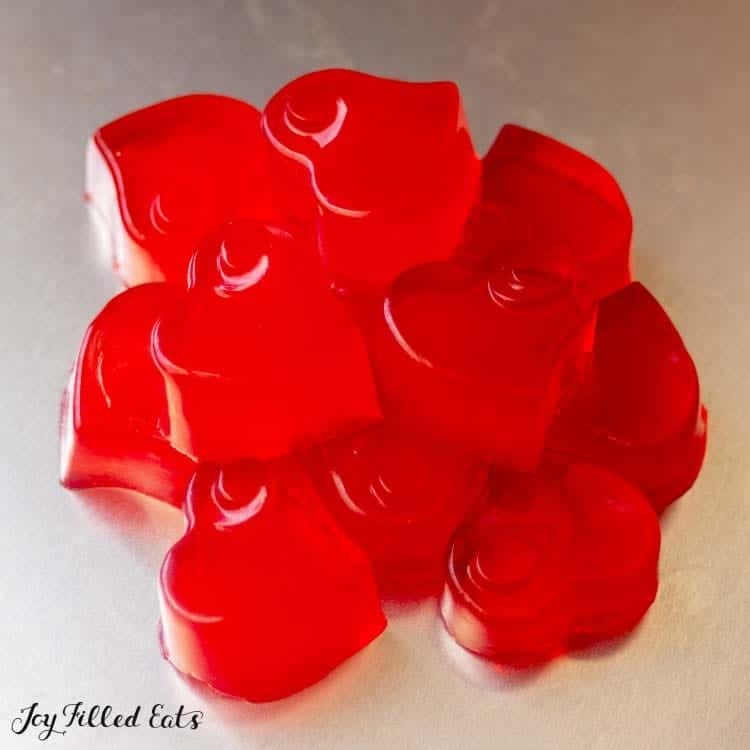 So I followed the recipe above - I don't get these nice shiny deep red gummies - no big thing...I really don't want to put much more red coloring in them..... my problem is with the consistency - like jello - is that right? 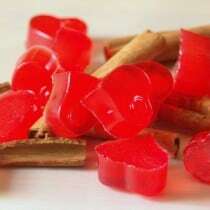 I really don't know what I expected, with nothing to make them gummy :) They did come out right I guess - just like strong cinnamon jello bears :) I like the strength of the cinnamon....a nice bite. Am I doing something wrong? Should I add anything else to make them more chewy like regular gummies? Are you using the lorann cinnamon oil or a different brand? And knox gelatin? You can always add more gelatin to make them chewier but at some point you start to taste the gelatin. Sorry for the delayed response. This got buried in my messages. Any of them that say "3x to 4x stronger than typical alcohol-based extracts" are fine. What molds do you use for these?? How would you store these? I just made some and I have to limit my son, he loves them!! Taryn, I don't have cinnamon oil on hand, but have cinnamon extract. I know it's not the same thing, but wonder if it would still work so I can try these. I think they would taste cinnamony but not spicy cinnamon like a red hot. I don't have better stevia, I have plain stevia, is that the same thing? How much is a scoop? I'm used to a dooink not a scoop. Why do you need 2 sweeteners? I'm really excited to try this I love cinnamon gummies! A scoop is that teeny tiny scoop in the bottle. I think it's 1/32 of a tsp. Is your stevia pure stevia? I spun my container all around and never found a scoop, so I just used a dooink. They are chilling in my fridge now and I can't wait to try them! How did you get your gelatin to dissolve? The first pack did with out a problem, after that it was all gloppy. I stirred forever trying to get it to dissolve before I gave up and strained it. Most of it normally dissolves for me but I do strain it too. I just made these and I am so happy with how they turned out!! Thank you...I am wondering if you have tried other flavors? Is 'Better Stevia' pure stevia or is it a mixed blend of something. I can't find it in our stores around here. Could I use the THM Pure Stevia instead? If so, how much would I use? Yes, it is pure stevia. And, yes, you can sub the THM stevia. It should be the same amount or a little less. How much of the THM gelatin is equivalent? Do you know? And I have cinnamon oil that I use for glass candy at Christmas thst you buy at the pharmacy counter. That would work? So after these have set do they need to stay refrigerated? Thinking about a car trip... What do you think ladies? Yes, they melt if they get hot. I think they'd be fine in a cooler with an ice pack though. I LOVE THESE!! Thanks Taryn! Hi Cheryl, To be honest I have no idea. Sorry. I use the Knox gelatin and they were much chewier than jello. Maybe it's stronger than the Great Lakes variety. You could try heating just a few of them and adding a tiny bit more gelatin to see what happens.